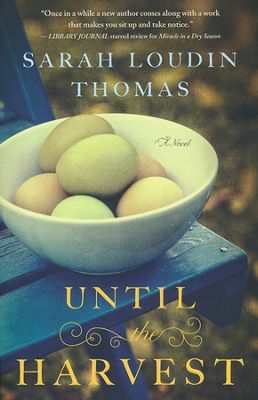 Until the Harvest by Sarah Loudin Thomas is a beautiful story set in the 1970’s. Although it follows Miracle in Dry Season, I was able to follow the storyline very easily even though I had not read that book first. The writing is extremely well done and I was caught up in the story by the first chapter. Until the Harvest tells the story of a young man, Henry Phillips, a college boy who finds himself at home for the holidays when tragedy strikes. He could be described as a spoiled brat who is used to doing what he wants, when he wants. Lost in his own sorrow, anger and feelings of abandonment, Henry goes from one bad choice to another until he finds himself staring at a huge mess in his life. It’s also the story of a young woman who is unloved and unwanted. The oldest daughter in a wealthy family, Margaret is used to not living up to her mother’s standards. Her solace is her little sister, Mayfair. Mayfair’s gifting makes her special in many ways and it’s her unique way of loving people that allows her to do things beyond most people’s understanding. I would absolutely recommend Until the Harvest and give it five out of five stars. I received this book from Bethany House Publishers and The Book Club Network in exchange for my honest review which I’ve provided here.